Some useful PA resources – the Bureau of Workers’ Compensation Quick links page and the PA Employer’s Guide to Workers’ Compensation. 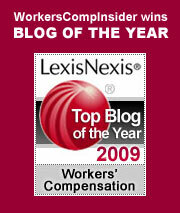 Both of these pointers came from PA Judge Robert Vonada who has a workers compensation weblog worth checking out. While he covers WC in general, his main focus is recent PA court decisions related to WC. Ouch! Pain drugs or drug pains? The Bloviator points us to the fifth article in an excellent series on prescription drugs that ran in the Washington Post. This article deals with the millions of Americans who are turning to Mexico to curb rising drug costs – a practice not limited to consumers. In their quest to secure prices that are 20 to 70% cheaper, some municipalities are virtually turning into international drug cartels. Today, Boston announced its intent to buy its drugs in Canada. *Prescription drug share of medical costs by accident year in Workers Compensation (WC) grew from 6.5% in 1997 to 9.6% in 2001. *Utilization has a greater impact on WC drug costs than price. *WC pays roughly 125% of the Average Wholesale Price (AWP) of prescription drugs; Group Health (GH) pays only 72%. Therefore, WC paid 74% more than GH for the same drugs. *Generic equivalents are prescribed when available 79% of the time for WC claims. A total of 56% of WC costs are associated with drugs that have no generic equivalent. Therefore, savings opportunities from using generic equivalents are only available for approximately 8% of total WC drug costs. *Painkillers represent 55% of the cost of prescriptions in WC. Posted in Medical Issues | Comments Off on Ouch! Pain drugs or drug pains? As Kelly goes, so goes the nation. More and more, the nation’s health care crisis is bleeding into the workers’ compensation insurance arena where medical costs in a number of jurisdictions are rising dramatically. Until now, many states had insulated themselves from escalating costs by creating and enforcing medical fee schedules, most often tied to Medicaid rates. While this strategy has mostly kept the lid on the pressure cooker of medical reimbursement, steam is beginning to escape as the medical community brings its considerable weight to bear on insurers. Around the country employers are feeling the heat intensify. This week, Kelly Services, Inc., a large, international, publicly traded (KELYA) temporary staffing agency, saw its quarterly profit fall sharply due to an increase of $6.4 million in workers’ compensation medical costs. The company, which places people in professional and industrial jobs, said that the third quarter workers’ compensation charge is the principle reason that its earnings have dropped from 18 cents a share a year ago to 4 cents a share this year. In some states, medical costs now exceed the costs of indemnity, or wage replacement, costs. Nearly ten years ago, LynchRyan predicted that such a thing could happen (The LynchRyan Report, Spring, 1994, Managed Care – Who Manages, Who Cares? ), but even we never thought things would get so bad so fast! Posted in Medical Issues, Misc. | Comments Off on As Kelly goes, so goes the nation. The good news? In 2002, workplace deaths fell by 6.6% (excluding 9/11). This marks the lowest level in the ten years the census has been conducted. The bad news? Some jobs are still way too risky. The Bureau of Labor Statistics just issued its annual report on the most dangerous jobs, on-the-job fatality rates, and other work-related injury and death statistics. Another positive note in this year’s report is that workplace homicides continued to drop, falling to 609 – a sharp contrast to the 1984 high of 1,080. But disturbingly, homicide is the chief cause of workplace fatalities among women. Overall, highway accidents are the single biggest killer, representing a quarter of all work-related deaths. The full report can be accessed at the BLS site. Sometimes when workplace prevention breaks down, the events affect more than your employees as was the case in last week’s tragic N.Y. ferry crash that resulted in 10 deaths and 42 injuries. The accident investigation is underway, with all eyes on the Captain. Substance abuse testing of the crew showed no problem areas, but there have been some as-yet unconfirmed reports that the Captain was incapacitated after failing to take blood pressure medication. There will no doubt be prevention lessons that all employers can learn as the blame game in this event plays out. Also worth noting: as public transport employees with “safety sensitive” jobs, the ferry crew were subject to random drug and alcohol testing as required by the D.O.T. But even those employers whose industries do not fall under the “safety sensitive” mandate should consider building an alcohol and drug free workplace. More than 1,000 small employers in Ohio were left in the lurch for workers compensation and health care coverage when Team America Inc., a Professional Employer Organization (PEO), filed bankruptcy last week. Employers take note: engaging a PEO does not release you from your responsibility to cover workers by a valid workers’ compensation policy. Check these useful tips from the California Department of Industrial Relations that will help in determining the legitimacy of your workers comp coverage under a PEO. Tip of the hat to Robert Vonada of the Pennsylvania Workers’ Compensation Journal for pointing us to this Washington Post article on OSHA and reporting rules for repetitive stress injuries … or perhaps it is more accurate to say the lack-of-reporting rules. In its 3rd Annual Health and Productivity Management Awards. the American Psychological Association (APA) last week honored companies for demonstrating innovative best practices aimed at to creating better places for their employees to work. Learn more about this program at the APA site. The Workers Compensation Rating and Inspection Bureau of Massachusetts has introduced an Assigned Risk Premium Calculation tool to help producers and employers calculate workers’ comp assigned risk premium to submit with their insurance application. For insurers, see the Residual Market Burden Estimator. Both can be found under Underwriting Tools and Forms.